Mary O’Brien who served nearly fifty years in the Ladies of Charity certainly will be missed. Mary always had a contagious happy smile, tons of energy and always found time to help others and give of herself. 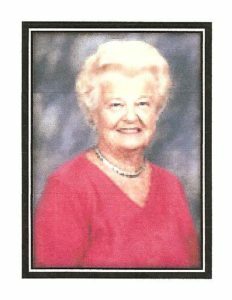 In addition to many contributions at St Jane De Chantal parish over the past fifty years, Mary also served as president of Ladies of Charity from 1976 to 1978. She was always there to help organize LOC activities through the years. Mary exemplified the true spirit of a Lady of Charity. Mary’s motto was Faith, Family and Friends. She was blessed abundantly with all three. Mary lived in Bethesda for 50 years and was an active member of St. Jane Frances de Chantal parish Ladies of Charity.